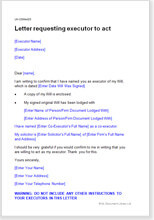 Letter to proposed executor of your will, asking whether he will accept the office on your death. Provides additional basic information he might require now. This is a straight forward letter to proposed executor of your will, asking whether he will accept the office on your death. It provides additional basic information he might require now.